Is the United States facing permanent gridlock? The government spends billions of dollars annually on highways and public transit systems, but traffic congestion seems worse than ever. Rush hour in many cities now lasts practically all morning and afternoon and reaches far into the surrounding suburbs. The tie-ups cost motorists at least $74 billion every year in wasted time and fuel. 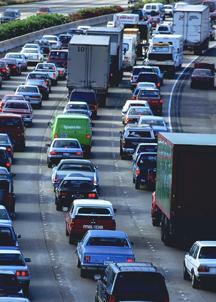 State and local officials are being urged to build new roads and expand existing highways. But environmentalists and preservationists are filing lawsuits across the country to stop major highway projects. They're concerned about the effects of greater traffic on air pollution. Congress is likely to be drawn into the fray.